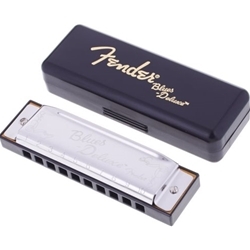 The Fender Blues Deluxe harmonica is designed to be versatile for all levels of player. Its classic tone and pitch is made possible with a molded PVC comb and brass reeds. Traditional shape and chromed metal covers will make your harmonica comfortable and easy to play. Reed plates are also replaceable. Includes vented hard plastic case.